Eike von Repgow. Sachssenspigell: Uffs new Durchaus Corr[i]girt und Restituirt Allenthalb wu dye Text Vorandert und Unuorstentlich Gewest, Mitt Vil Nawen Adicionen aus Gemeynem Keyserrecht Gezogen, Sampt eynem Volkommen Nutzlichen Nawen Gemerten Repertorio. Edited and translated by Christoph Zobel. [Leipzig: Gedrugkt zu Melchior Lotter, 1535]. 31 cm. Contemporary paneled pigskin with elaborate blind tooling. 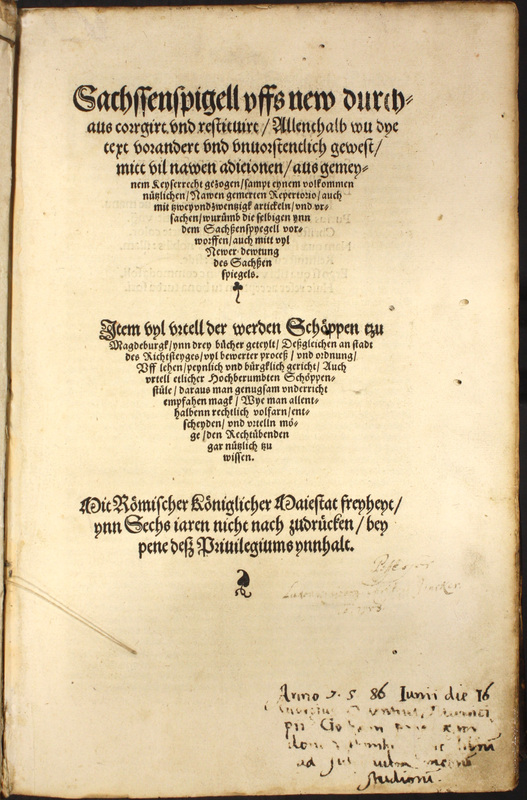 The Sachsenspiegel [Mirror of the Saxons] is a deeply influential collection of territorial and feudal law compiled around 1230 by Eike von Repgow (or Repkow), a German knight and judge. It was the basis for several subsequent codes, including the Gorlitz Lawbook, the Breslau Territorial Law, the Schwabenspiegel, the Dutch Sachsenspiegel and the Berlin Townbook of Brandenburg Law. An authority on civil law well into the nineteenth century, it was a source for the German Civil Code (1896). This volume boasts both fine typography and woodcut decorated initials. An early owner added extensive annotations to the front pastedown (the portion of the endpaper that is glued to the inner boards of a book) and the foot of the title page -- there are also brief annotations and underlining in an early hand to some text leaves. This first edition was printed by Zobel. The text is in German with a parallel Latin translation. Christopher Zobel (1499-1560) was a professor of law at at the University of Leipzig. In addition to editing and translating this text he added a set of glosses and an index (Repertorium). Zobel's version went through several editions. Tarlton holds one of three known North American copies.